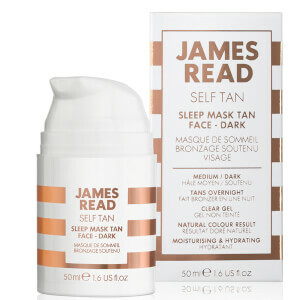 Develop a natural-looking, sunkissed complexion with the James Read Sleep Mask, a gradual self-tan for the face. 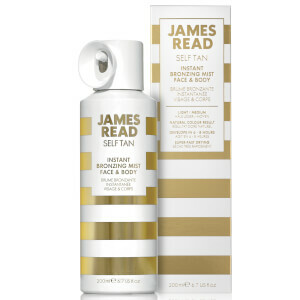 Developing through the night during your skin's most receptive hours, the fast-drying formula is colorless to keep bed sheets and clothing clean, and expertly transforms into a light sunkissed hue that can be built upon for a more intense color. Its dose of Aloe Vera, Hyaluronic Acid and Algae Extract keep skin soft and hydrated whilst promoting a longer lasting tan with even fade. Fragrance free. Suits all skin tones. Apply thin layer to clean, dry face and neck, blending into hairline and décolletage. Wash hands after use and avoid contact with water for 8 hours. Aqua/Water/Eau, Dihydroxyacetone, Dimethicone, Glycerin, Aloe Barbadensis Leaf Juice, Cyclopentasiloxane, Polyacrylamide, Phenoxyethanol, Cyclohexasiloxane, Sodium Acrylate/Sodium Acryloyldimethyl Taurate Copolymer, DMDM Hydantoin, Panthenol, C13-14 Isoparaffin, Xanthan Gum, Algae Extract, Isohexadecane, Polysorbate 80, Tocopheryl Acetate, Laureth-7, Citric Acid, Cucumis Sativus (Cucumber) Fruit Extract, Potassium Sorbate, Benzyl Alcohol, Hyaluronic Acid, Sodium Benzoate, Sodium Dehydroacetate, Sodium Salicylate.